AP Chemistry teachers will no doubt be familiar with Talanquer’s photoelectron spectroscopy (PES) simulation. This resource became popular following the AP Chemistry redesign in 2013 and Jamie Benigna’s webcast for the College Board on PES that included it among the teaching resources. The new version, linked above, fixes the “stacking” problem that plagued the old version and makes students’ interpretations of the spectra much more efficient. Before this week, I was completely unaware this resource was part of a larger collection of excellent simulations that have the potential to hold a prominent place in any chemistry classroom. The second simulation I want to highlight is entitled Activation and Temperature. 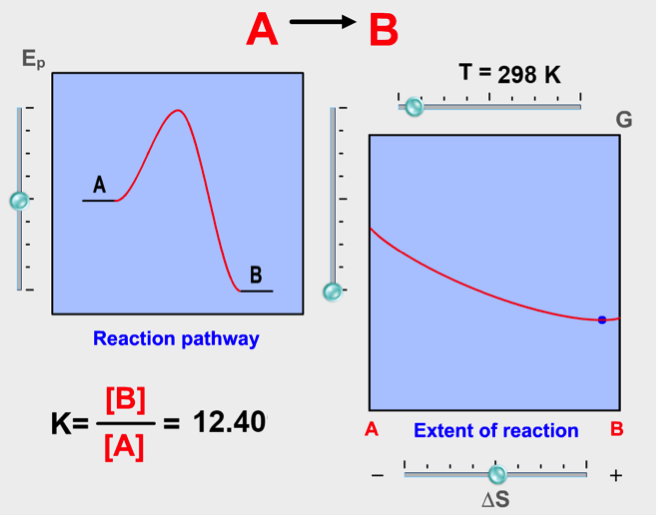 This very simple simulation allows students to explore the connections between activation energy, chemical potential energy, and temperature. Most impressively, it explicitly connects the graphical, particulate, and symbolic representations of the reaction in a single screen so students can easily draw connections between the different representations as they watch the reactant molecules collide to form a transition complex and then product molecules. This will be a welcome addition to my kinetics unit this fall. The third simulation that caught my attention is called Free Energy and Equilibrium. This simulation takes what is depicted as a static graph in many textbooks and allows students to manipulate the parameters to investigate the connections between the equilibrium constant, change in Gibb’s Free Energy, temperature, and entropy. This simulation would be useful as a demonstration, with an accompanying student worksheet, or as an avenue for students to explore at their leisure while they wrestle with the concept. Also included are a student-friendly interface for graphing points and adding a line of best fit, an intuitive molecule illustrator for quickly drawing particle diagrams, and a particulate-level movie builder. I hope you take the time to explore the simulations available and share your thoughts. Which simulation do you think would be the most useful in your classroom? Does anyone already use these simulations and have activities or demonstrations designed around them?